An eloquent exploration of creativity, The Origins of Creativity grapples with the question of how this uniquely human expression—so central to our identity as individuals and, collectively, as a species—came about and how it has manifested itself throughout the history of our species. In this profound and lyrical book, one of our most celebrated biologists offers a sweeping examination of the relationship between the humanities and the sciences: what they offer to each other, how they can be united, and where they still fall short. 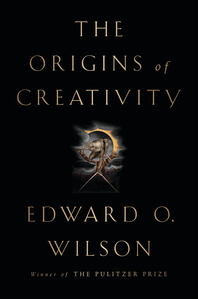 Both endeavours, Edward O. Wilson reveals, have their roots in human creativity—the defining trait of our species. Reflecting on the deepest origins of language, storytelling, and art, Wilson demonstrates how creativity began not ten thousand years ago, as we have long assumed, but over one hundred thousand years ago in the Paleolithic age. Chronicling this evolution of creativity from primate ancestors to humans, The Origins of Creativity shows how the humanities, spurred on by the invention of language, have played a largely unexamined role in defining our species. And in doing so, Wilson explores what we can learn about human nature from a surprising range of creative endeavors—the instinct to create gardens, the use of metaphors and irony in speech, and the power of music and song. Our achievements in science and the humanities, Wilson notes, make us uniquely advanced as a species, but also give us the potential to be supremely dangerous, most worryingly in our abuse of the planet. The humanities in particular suffer from a kind of anthropomorphism, encumbered by a belief that we are the only species among millions that seem to matter, yet Wilson optimistically reveals how researchers will have to address this parlous situation by pushing further into the realm of science, especially fields such as evolutionary biology, neuroscience, and anthropology. With eloquence and humanity, Wilson calls for a transformational "Third Enlightenment," in which the blending of these endeavors will give us a deeper understanding of the human condition and our crucial relationship with the natural world. “As always, Wilson tosses off astonishing insights with charming ease (he’s a master of the lyrically short sentence). These profoundly humane meditations on nature, creativity, and our primal yearnings will delight his longtime fans and provide newcomers with the perfect introduction to the career and ideas of one of our most distinguished living scientists—whose high school nickname, I was enchanted to learn, was 'Snake Wilson. '” — Jim Holt, author of Why Does the World Exist?